I get a ‘gold star’ for procrastination! I’m very good at dragging my feet when I am starting a project that I’m not excited by……. Like dish towels. I promised my brother and sister-in-law some for their Christmas present….. and here it is almost March and I’m just getting around to making them. 😦 bad Julie!! When I went into my ‘studio’ to pick out the yarn colors a couple of weeks ago I got distracted by cleaning (a bit)…….. then I started looking at fiber! I started throwing all sorts of different clumps together and thinking….. I’m going to card! I had to put that thought on hold while I decided on which old cotton threads I was going to use. 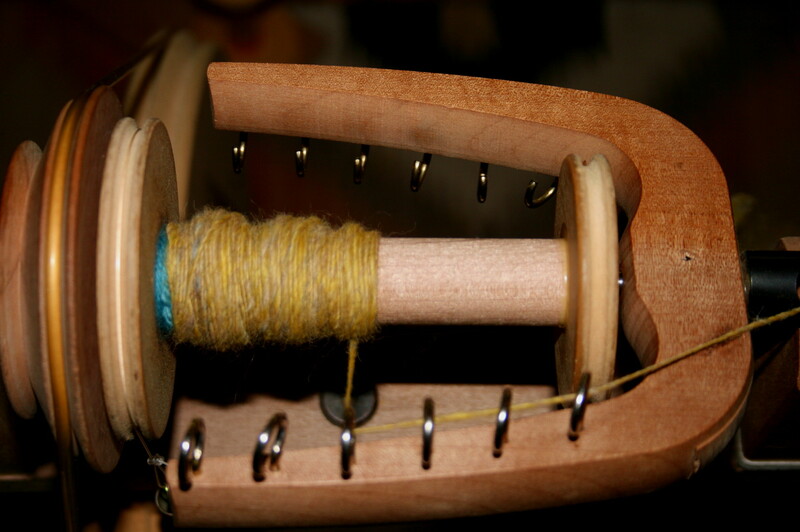 But after choosing my colors…… my arms gathered up the heap of fiber and I happily plopped down in front of my drum carder….. instead of winding a warp. 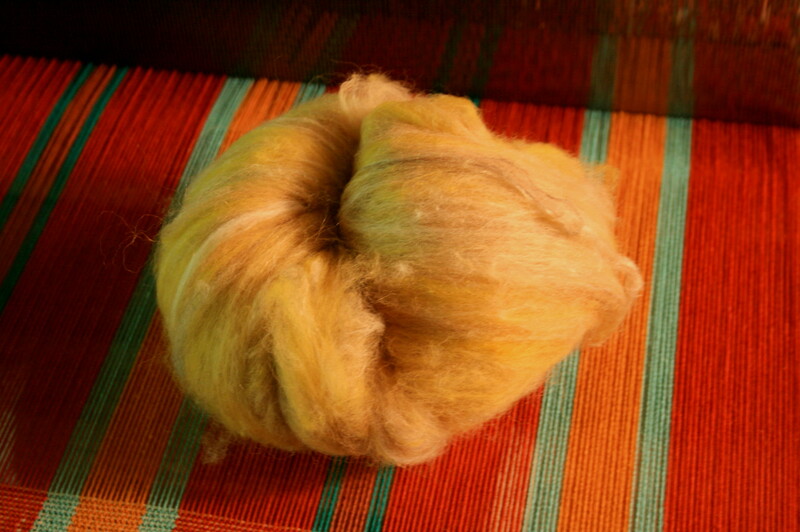 Then of course I had to see what it looked like spun up! 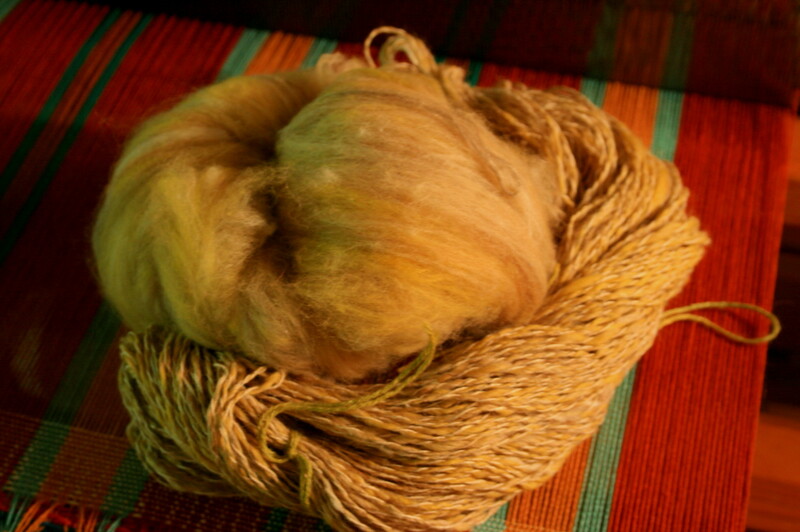 Then I decided to ply it with some of the hemp yarn I recently bought…… next week I’ll weave it on a hemp warp……. 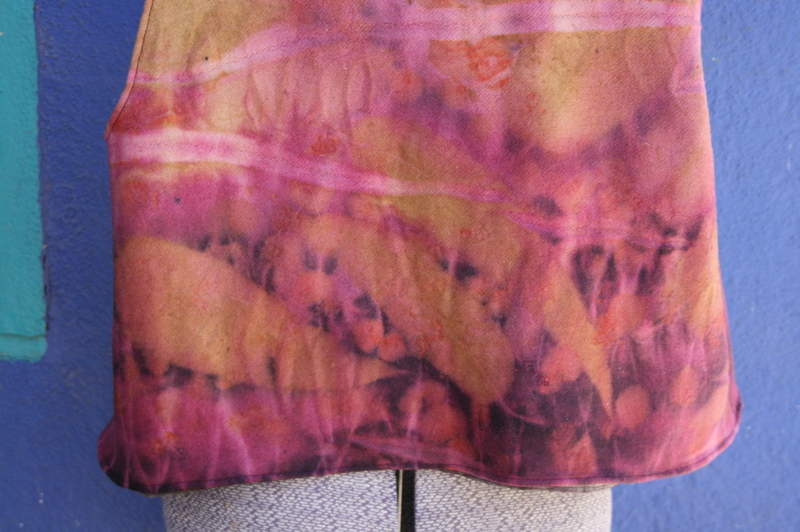 and then eco print it! Oh what? Dish towels!? Dang. 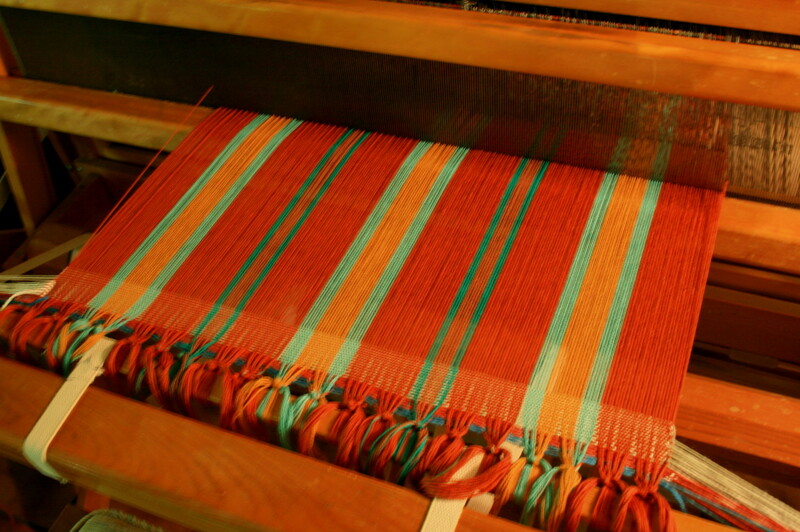 Yesterday I finally said….. thread your loom!! 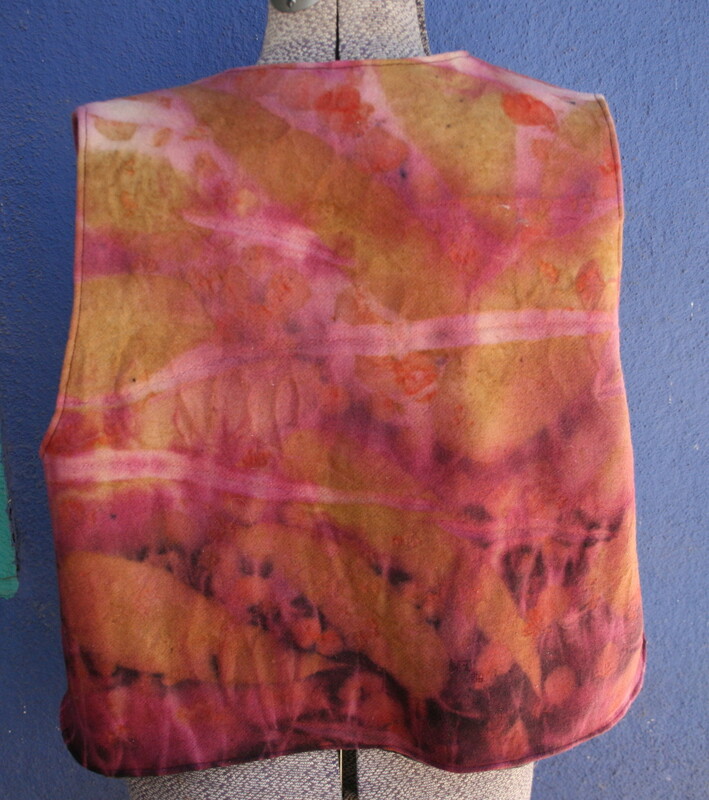 Then proceeded to putz around dyeing some raw silk to make my son-in-law a scarf for his birthday. I put all of the names on card stock labels, folded them over and taped them shut. Then I put them into my old trusty wool felt hat….. and had my partner draw one (yes, I know, it’s an hour and a half until the 20th….. but I really didn’t think that there would be any more names in that time). There ended up being 15 names in the hat! I was very surprised. 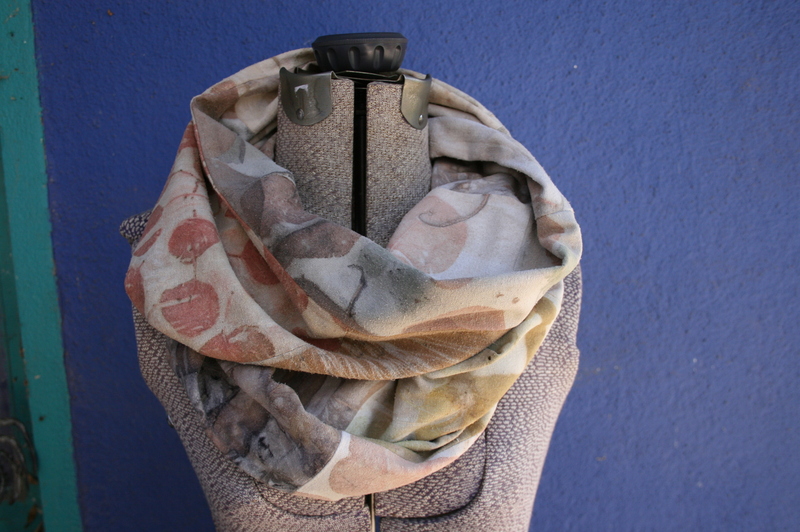 So Laura….. send me your address and I will get your new cowl off to you in tomorrow’s mail! 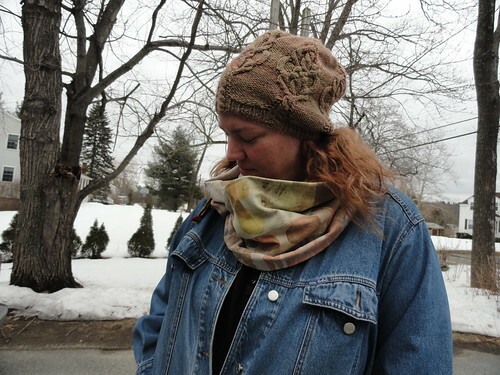 Here’s the link to Laura wearing her new cowl! 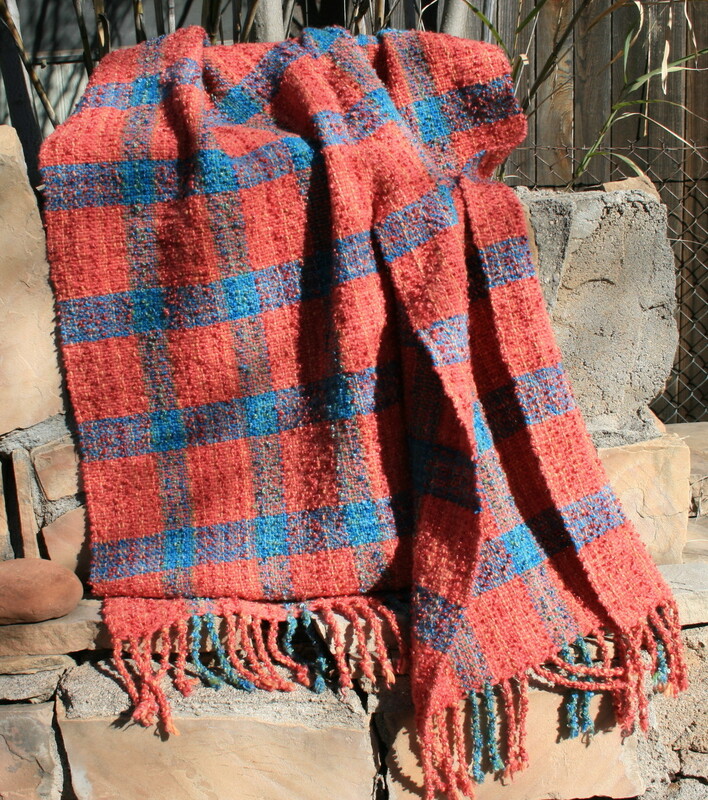 And here is a photo of the shawl from last week. I’m not sure why they are shrinking up so much widthwise…… maybe I’m rinsing/agitating them too much trying to get all of the residual dye out. I could use synthrapol …… but I am trying to avoid chemicals. Or it could be the new yarns that I’m using? P.S. The drawing was fun……. I should do this more frequently!! …… was what Jeph asked me. No silly…. it’s a cowl! Just let me turn it right side out. Hummmm….. not too smart! I did make a windsock! So with a little unstitching and refiguring, it is now the cowl it started out to be!! SO, I decided that I haven’t had a ‘give-away’ in a LONG time…… it is now time! If you want to be entered in the give-away just leave a comment to that effect and I’ll toss your name into a hat. The lucky winner will be drawn on February 20th. And yet again I have over shrunk, instead of merely fulling, a scarf! It went from 16 inches wide to 5 inches wide in the blink of an eye! Ah well….. 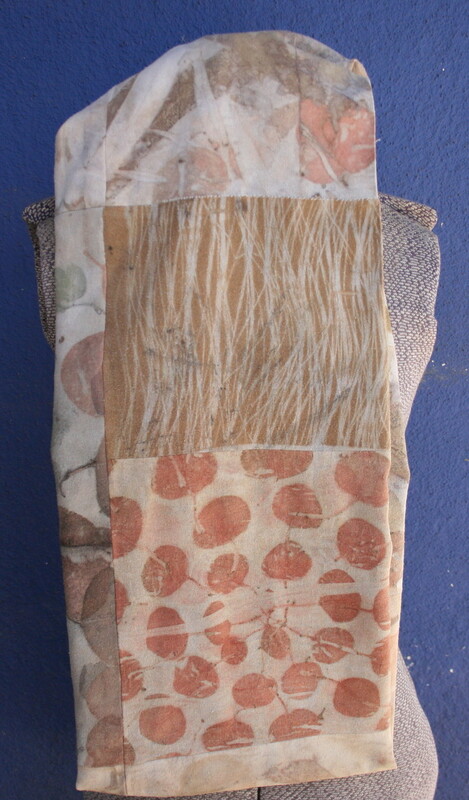 I had woven it to eco print, so I did that anyway. 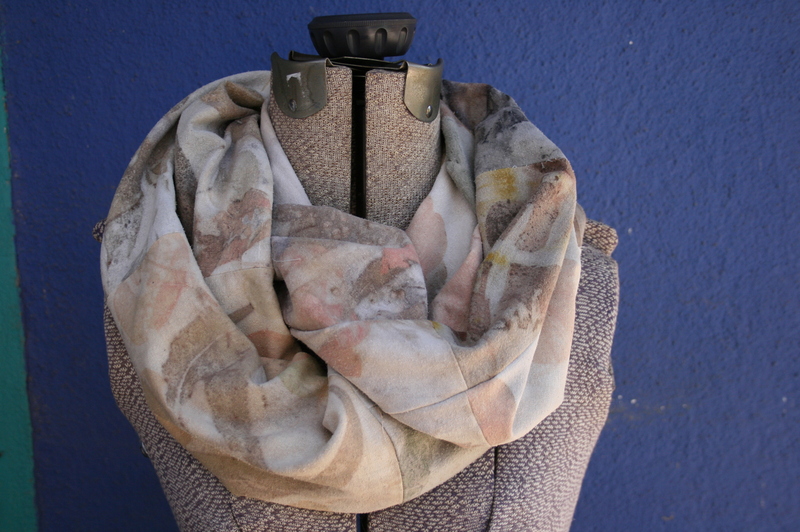 It’s too dense and thick for a scarf, but I’ll put it to use somehow! 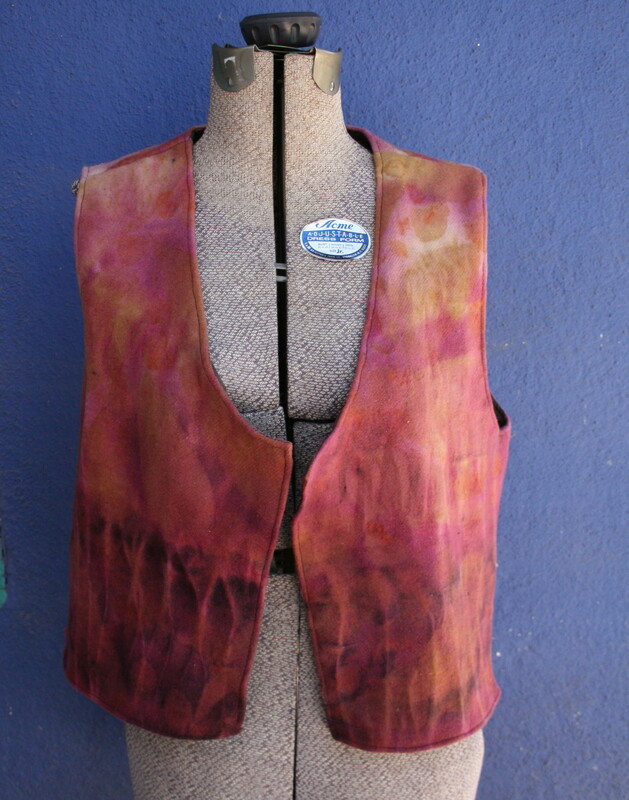 And I’m sort of finishing a vest I started last winter. I wore it to work last week, but the lining is wonky….. maybe I should take the lining out? 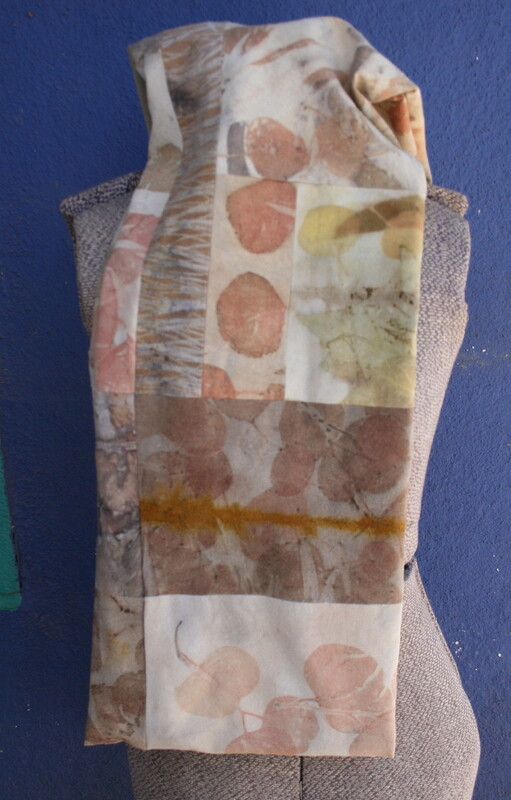 It’s made from an eco printed old wool blanket (complete with small moth holes). An attempt to make a pattern from a favorite old vest.